Berlin - They may have finished the contest empty-handed, but Hertha Berlin nevertheless returned north with their growing reputation further enhanced in the wake of last Saturday's 3-2 loss at FC Bayern München. The club from the capital, freshly back in the Bundesliga this season, pushed the German and European champions all the way through to the final whistle, in the process becoming the first team to put two goals past them in the current campaign. The performance, if not the result, was only the latest indication that Hertha, twice relegated in the past four years, are well on course for their primary target of steering clear of a highly undesirable hat-trick in that department. Ten games into the campaign, and the setback at the Allianz Arena notwithstanding, Jos Luhukay's side are sitting fifth in the table, a single point shy of a Champions League qualifying berth. The Dutch head coach is not setting his sights quite that high this season but, having led Hertha back to the top flight in style at the first time of asking, he has evidently done a fine job of remoulding the team over the summer break in such a way as to make the transition back to top-flight football as seamless as possible. Above all, Luhukay turned to players he had worked with before to strengthen his ranks and three of them have formed the core of the side's new-look defence this season. 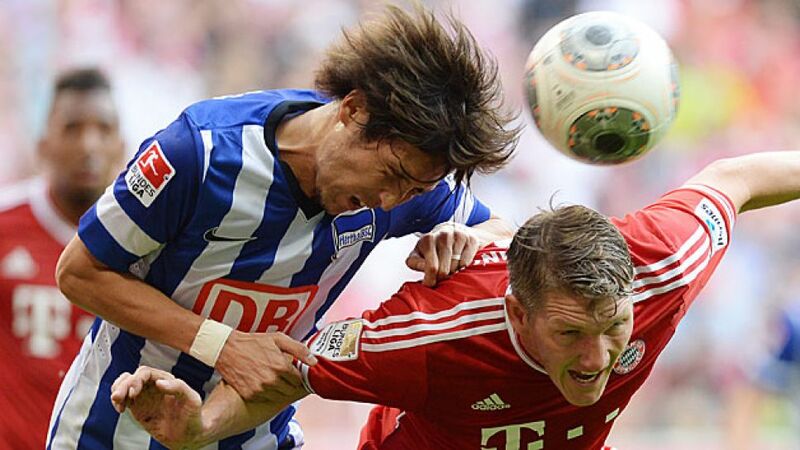 Alongside left-back Johannes van den Bergh and central defender Sebastian Langkamp, Hajime Hosogai has been a vital cog in the Hertha defensive bulwark, sitting just in front of the back row in a holding midfield role. The 27-year-old Japan international, who played under Luhukay at FC Augsburg when they won promotion to the Bundesliga for the first time and subsequently defied the odds by staying there, has been a virtual ever-present this season, missing less than a quarter-hour of on-field action all-told in the league to date. Impressively as both he himself and the team had performed in the opening nine rounds of action, however, Hosogai acknowledged after the latest encounter in Munich that: "We wanted to test ourselves against a side of Bayern's quality. It's just a pity we didn't manage to come away with a point." "The goals we conceded were avoidable, although Bayern's individual quality tipped the balance in the end," Hosogai reflected. Hertha, he explained, "hadn't gone into the game with any special plan. The coach actually said there would be no point in changing our normal style just because we were playing Bayern. They were obviously going to be seeing a lot of the ball so we were looking to make sure we defended well from the start and wait for our own chance to get forward”. On the defensive front things didn't quite work out as hoped, but overall it was a brave and assured display from the visitors against a team they knew were likely to steamroller them given the slightest opportunity. Now, Hertha aim to get back to winning ways this coming Saturday against another Bundesliga heavyweight, FC Schalke 04, this time on home turf. Hosogai will doubtless assume his usual understated link-up role between defence and attack, helping keep the Royal Blues' creative talents in check while providing a vital line of supply to Hertha's own forward department. On the subject of his personal role in the overall scheme, and asked what it had been like to go up against the likes of Götze, Philipp Lahm and Bastian Schweinsteiger in Munich, he responded: "I just do my best, whoever I'm up against, but I was facing some world-class players today. What I think now is that I need to improve even more. We've got some tough games ahead. If we want to keep pace with the top sides, we can't afford to keep giving away easy goals when we play them."